An artist’s rendering of the new SCC pedestrian bike bridge. Artwork provided by Drake Haglan & Associates. Light rail regulars know that the area around City College’s campus can be dangerous for pedestrians because of high-traffic levels and a lack of safe places to walk. These students will be happy to learn that as part of the 72-acre Curtis Park Village project, the city has plans to link the Land Park area with the Curtis Park area by way of a bike path on the City College campus and a foot bridge that will link the campus to the Light Rail station. 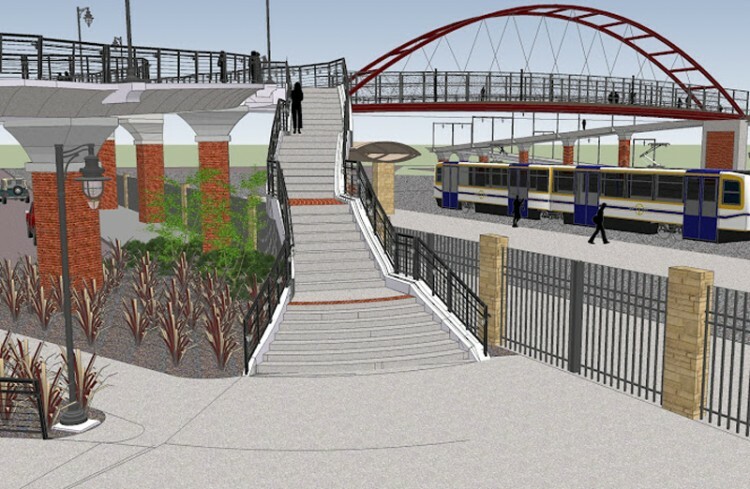 The bridge is planned to go over the Light Rail tracks to create a safer and more effective means of transit for pedestrian traffic, which will be especially important once the housing development and commercial area are complete. According to the Sacramento Bee, the project is planned to include a grocery market, coffee shop and housing community, which the Bee said will contain 178 single-family lots and 349 multifamily units. The article also said 90 senior housing units will also be added. For City College students , the new development will offer more opportunities and activities between classes. The land known as Curtis Park was used as a rail yard for many years. When it closed, the land was deemed toxic because of waste that was left from the rail yard. After several years in the process of decontaminating the soil, the cleanup was completed back in February 2012 and a cleanup celebration ceremony took place at that time. Construction has yet to begin because Petrovich Development Company, the contractor in charge of the project, has been working to secure permits, a process that the company’s senior vice president and the project’s manager, Phil Harvey, says is a just something that has to be done. Harvey also said that in the next few months, the focus will be on getting everything set up to begin work on the infrastructure of the community by the first quarter of 2013. He explained that before the housing and other buildings can begin construction, the infrastructure including the roads, pipes, landscaping systems and underground elements must first be in place. Following the completion of the infrastructure, Harvey said work on the buildings should begin in the summer of 2013. When complete, this project will greatly increase interest in and accessibility to City College, especially for pedestrian traffic, and will make the area around the campus more valuable to the citizens of Sacramento. Though there is no definite timeline in place, Harvey says the project should be completed within the next five years. Most of the construction is scheduled between 7 a.m. and 7 p.m., seven days a week, though trench work and the closure of 24th Street will be necessary for some time scheduled at night. More information on the project is available by contacting Petrovich. Written in collaboration with Claire Sullivan. This entry was posted in News, Sac City Express (SCC) and tagged City College, Claire Sullivan, construction, Curtis Park Village, footbridge, pathway, project, Sac City College, SCC. Bookmark the permalink.